A Majority Of the $80 Million Flowed To Just Two Of The 14 Races. In Both, Democrats Had Financial Advantages And Flipped Seats That Were Previously Held By Republicans. LANSING (Jan. 22, 2019) — The 2018 election saw the most expensive campaigns for the U.S. House in Michigan history as groups funded by top national donors poured money into the state. The primary and general election races for Michigan’s 14 seats in the U.S. House attracted about $80 million, according to candidate fundraising disclosures, independent-spending reports by groups and an analysis of TV advertising data from Kantar Media/CMAG. The 2018 total is double what the same races attracted in 2016: $40 million. The jump in overall money in the races was the result of two highly competitive elections, increased fundraising by Democratic candidates and an influx of spending by super PACs, which can raise and spend unlimited amounts of money. The 8th District contest between incumbent Rep. Mike Bishop, a Republican from Rochester, and Democratic challenger Elissa Slotkin, a Democrat from Holly, reflects these trends. That race alone attracted $28.3 million, making it the most expensive individual U.S. House race Michigan has ever seen. The previous record was only about $14 million when Rep. Mark Schauer, a Democrat, lost his 7th District seat to Tim Walberg, a Republican, in 2010. The totals are based on the candidates’ fundraising for the election cycle, independent spending reported in the races and tracked spending on broadcast TV ads that either criticized or praised candidates but wasn’t otherwise disclosed. The Center for Responsive Politics, which tallies money in the races slightly differently, ranked Michigan's 8th District race as the fifth most expensive U.S. House general election race nationally. The 8th District saw a surge in spending by independent groups, who invested about $16.6 million in the race. Slotkin, who had a financial advantage, defeated Bishop to flip the seat for Democrats. Slotkin got 50.6 percent of the vote while Bishop got 46.7 percent. It was one of two Michigan seats that flipped from red to blue in 2018 as Democrats won back control of the U.S. House. The other was the 11th District seat, which was previously held by Republican David Trott. Trott decided not to run for re-election. In that district, Haley Stevens, a Democrat from Rochester Hills, got 51.8 percent of the vote while Lena Epstein, a Republican from Birmingham, got 45.1 percent. Groups acting outside of the campaigns spent about $7.3 million on the general election race in the 11th District. Of the $80.8 million tracked in the 2018 U.S. House races, $28.1 million — or 34.7 percent — was spending by groups that were acting independently of the candidates' campaigns. This is spending on things like TV ads and mailers. It's spending that's not coordinated with the candidates. Some of the independent groups had received more than $20 million from individual donors in the last two years. The most an individual can give directly to a U.S. House candidate’s campaign is $5,400. Of the $28.1 million in independent spending, a majority — $18.5 million — benefited Democratic candidates. The following is a breakdown of the four most expensive U.S. House races Michigan saw in 2018. A spreadsheet on the money the Michigan Campaign Finance Network tracked in the races is available at this link and a spreadsheet on the candidates’ fundraising hauls is available at this link. The 8th District race between Slotkin and Bishop now holds the record for being the most expensive U.S. House race in Michigan history. 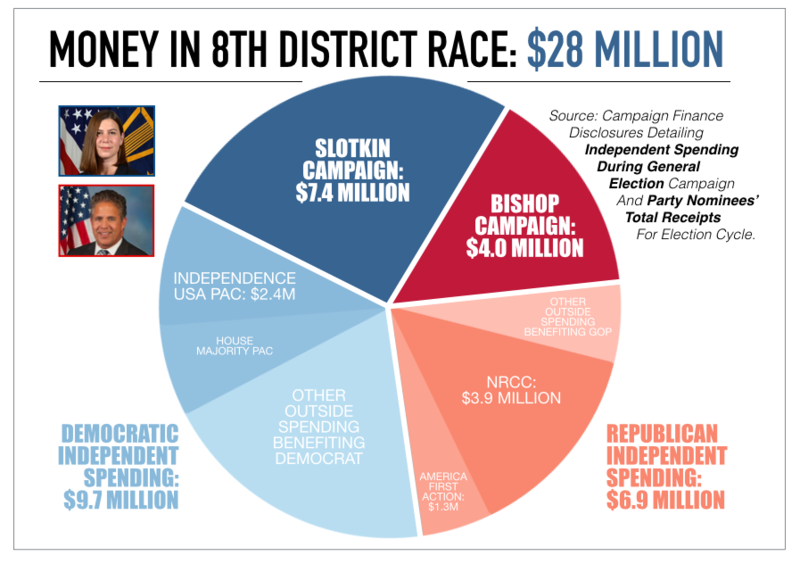 It also appears that no individual U.S. House candidate in Michigan has raised the amount of money Slotkin did, according to tracking dating back to 2004. Her receipts for the election cycle totaled $7.4 million, according to disclosures. Bishop’s receipts totaled $4.0 million. On top of the candidates’ fundraising, outside groups invested heavily in the race and helped balloon Slotkin’s financial advantage. Two of the biggest spenders were the National Republican Congressional Committee (NRCC) at $3.9 million and the Independence USA PAC at $2.4 million. NRCC, which backed Bishop, is a fundraising committee for House Republicans. The Independence USA PAC, which backed Slotkin, was primarily funded by former New York City Mayor Mike Bloomberg. Of the $28.1 million in the race, the majority came from independent spenders acting outside of the campaigns. 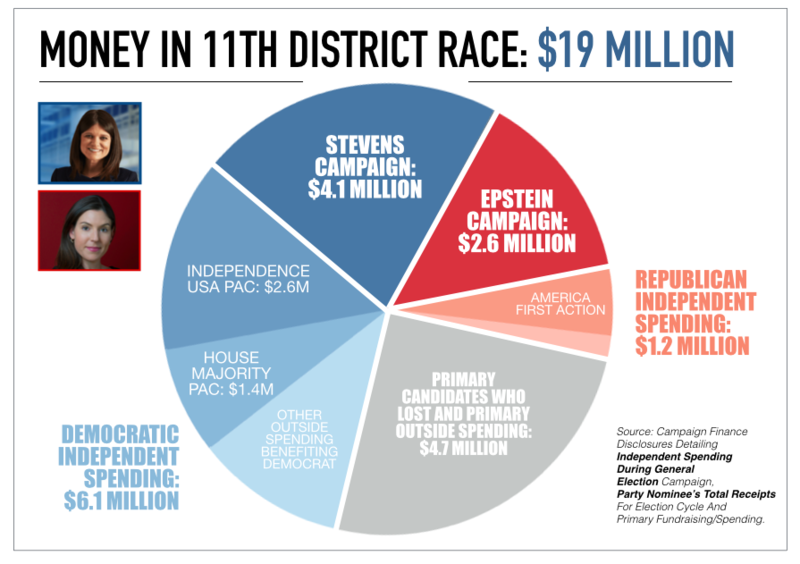 Those groups reported spending $16.6 million on the 8th District race. About $19.0 million flowed to Michigan’s 11th District race for the 2018 election. The district saw crowded primaries on both the Republican and Democratic sides. Then, there was a competitive and expensive race in the general election as well. Stevens, the Democratic nominee, raised $4.1 million. Epstein, the GOP nominee, raised $2.6 million, including $1.0 million in self-funding. Groups spent about $7.3 million independently of the candidates to try to influence the general election race, according to disclosures. The majority of the outside spending benefited Stevens. The biggest spender was Bloomberg’s Independence USA PAC, which reported spending $2.6 million on the race. 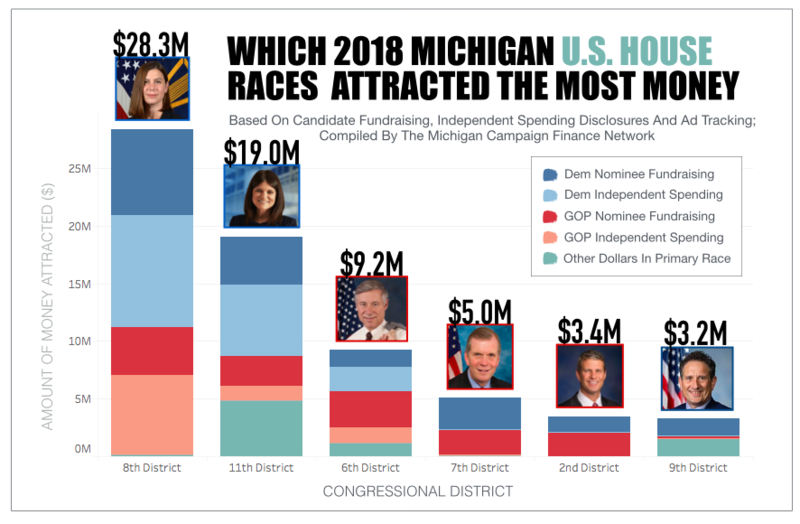 The general election race in the 11th District now ranks as one of the three most expensive U.S. House races in Michigan history when it comes to candidate fundraising and independent spending. Candidates who lost in the primary races in the 11th combined to raise $4.5 million, and a handful of super PACs spent about $283,000 on the primary contests. In West Michigan’s 6th District, Rep. Fred Upton, a Republican from St. Joseph, won another term in the U.S. House in 2018 despite a challenge from Matt Longjohn, a Democrat from Portage, and $1.5 million from a super PAC. Upton, who raised $3.1 million over the two years before the election, got 50.2 percent of the vote while Longjohn, who raised $1.4 million, got 45.6 percent of the vote. The race attracted another $3.4 million in spending from groups acting outside of the campaigns. A super PAC called Change Now spent $1.5 million against Upton. The American Hospital Association spent about $257,000 in support of Upton, and the Defending Main Street Super PAC spent about $407,000 in support of him. The 6th District also saw a competitive Democratic primary race. The three Democratic candidates who lost to Longjohn raised a combined total of $1.1 million for their primary campaigns. For the 2016 election, the 7th District race between Rep. Tim Walberg, a Republican from Tipton, and former state Rep. Gretchen Driskell, a Democrat from Saline, was the second most expensive U.S. House race in Michigan. It cost about $5.8 million. In 2018, the rematch saw less money from outside groups flow into the district, and the race ranked fourth at $5.0 million. Driskell’s campaign reported raising $2.7 million while Walberg’s campaign raised $2.1 million. Driskell ended up with 45.6 percent of the vote while Walberg won another term with 50.2 percent. There was only about $151,000 in spending from independent groups in the race. CORRECTION: In the image at the top of this post, Rep. John Moolenaar represents the 4th District. Rep. Bill Huizenga represents the 2nd District.